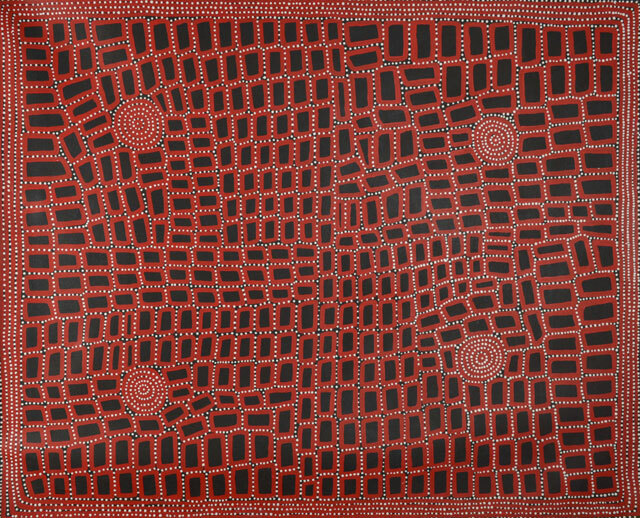 Walala Tjapaltjarri, brother of well-known painters Warlimpirrnga Tjapaltjarri and Thomas Tjapaltjarri, was born in the Gibson Desert east of Kiwirrkura in the early 1960’s. He was one of a small party, that included his brothers, several sisters, and two old aunts whose arrival in Kiwirrkura in 1984 made international headlines that proclaimed the discovery of a ‘Lost Tribe’. Until this time, at age 21, Walala had never encountered Europeans and their ways. The group had been following their traditional lifestyle in the country west of Lake Mackay and another brother Pierti, who had traveled with them, returned to the desert almost immediately thereafter. By 1990 Walala, by then a young man, lived in Kiwirrkura and watched in admiration and respect as his brother Warlimpirrnga began to paint. By 1996 Walala had taken to accompanying his brother on trips to Alice Springs where his paintings were shown, and it was on one of these trips that Walala himself was offered small boards, and was encouraged by his brother to paint. While Warlimpirrnga instructed Walala in the use of paints and canvas, from the outset he was seen to possess a bold and striking style. He took to painting with the assuredness of a man firmly grounded in his culture and intimately familiar with the sites he depicted. His subject from the outset was that of the Tingari cycle, a series of sacred and secret men’s mythological song cycles associated with a number of related sites in Walala’s country including Marua, Minatarnpi and Mina Mina in the Gibson Desert of Western Australia. In 1997 Walala produced a work on canvas unlike anything he had done before. Strongly gestural and boldly graphic it featured roundels, rectangles and abutting lines set against a stark monochrome black background. This was the distinctive and individual style that laid the foundation for the remarkable body of work that he has completed since that time. His first solo shows were held with Gallery Gondwana in Alice Springs, which was the gallery that encouraged and first presented his art. Following his 1998 solo exhibition at Coo-ee Aboriginal Art Gallery in Sydney, SMH art critic John McDonald enthusiastically endorsed his work and it appeared he was headed for a stellar career. However since that time Walala has become a nomadic and independent artist and this has seemed at times to mitigate against the collectability of his work. Nevertheless his success prior to 2002 was followed by his participation in a number of important exhibitions most notably at Fireworks Gallery in Brisbane where he had the opportunity to engage with international artists in the production of experimental modernist paintings and sculptures, and with Arts d’Australie in Paris. While his secondary market results are prolific with more than 50 works having been offered for sale since 1998 his clearance rate is an unfortunate 46%. This is due mainly to the large number of his works in galleries throughout Australia. Artists who are ubiquitous in the primary market rarely fare well in the auctions during their own lifetimes. While his auction sales total more than $64,000 his highest individual price remains the $6000 low estimate, paid at Lawson~Menzies in November 2004 (Lot 170) for a triptych in which each panel measured 198 x 41 cm. Yet despite this Walala is still a relatively young man and more than capable of creating works of the highest quality. Collectors should vote with their hearts with this artist. His importance is unquestionable. The nature of his imagery unique and, despite its ancient origins, ideally suited to contemporary interiors. While many of his early works may prove to be more collectable over time, those who simply love his work should look for fine contemporary examples like this pleasing work created in January 2007. The image itself is ideally suited to a canvas measuring 82cm x 138cm, The roundels representing ceremonial sites pull the painting comprised of traveling lines together in to what is altogether a most successful and dynamic work of art.